On the ground floor: double bedroom and sofa bed, facing south and west, 30sqm, stone floor. Large dining room for thirty guests. Conference and activities, 45 sqm. exposed on three sides. Three windows on the valley and three large doors leading to the north side of the structure, a nice fireplace. Room with private entrance, is part of the building’s oldest. In use to the owners in the days of arrival and departure of guests. Basement in stone and with a domed ceiling with exposed brick is a small cellar where you can taste a fine wine, toasting to the dim light of the cave, in an ‘atmosphere of tempi.Al first pianoCamera with panoramic views of the valley and the sea, 36 square meters, four beds in a bed and sofa bed for two people (twin), reading room with wood burning stove, bathroom putty color red. Room with a view on the main access road, the pool and the sea. 28 sqm Sleeps 3-4 including a four-poster bed. Room with balcony overlooking the south and a large north window overlooking the forest and the well is part of the oldest part of the building, 36 sqm., 3 bunk beds for a total of 6 beds. Room with forest view, 14 sqm. 2 beds combined, as needed to the room above, the tower, forming a beautiful suite, beautiful bath in lime green with old stone sink. Turret on the second floor, 21 sqm. double and two singles need the sofa bed. the ideal place to practice sports, yoga, meditation and holistic activities (they have 20 mats). Mountain Bik and rental to explore the woods and small medieval towns that surround the villa. For those who love nature can organize trekking, birdwatching, orienteering courses and all that the forest will offer to those who want to discover through the assistance of experts intimately familiar with the naturalist Nature Reserve and the whole of the Upper Cecina. 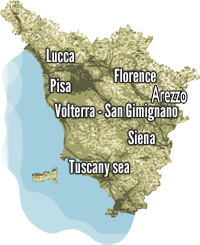 Italian courses for small groups with a teacher referenced, Tuscan cooking classes, The villa is able to offer a personalized service restaurant with a chef at home or on request for the duration of your stay. We propose menu ‘typical Tuscan menu, vegetarians and vegans. You can contact the owners to order if the Supper of the day of arrival and breakfast the hermitage.